An important chapter of Canada’s aviation history is told for the first time in a new book by S.R. 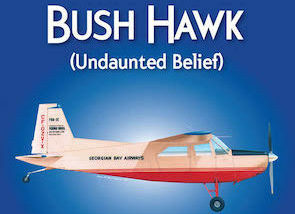 (Rick) Found titled Bush Hawk (Undaunted Belief). The Found family’s name is famous among bush pilots, worldwide, for having built a tough little freighter aircraft designed for hard service in Canada’s wilderness. The author’s father, Sherman, along with his uncle Nathan (Bud) Found with financial backing from department store magnate John David Eaton took on the herculean task of gaining FAA certification for their dream aircraft. Despite both financial and engineering setbacks they hung in and produced an airplane that outperformed anything being then imported from the United States. So why, with an industry begging for the plane, were only 27 aircraft produced? Financial consultants and timid bankers did the trick and crashed the Found FBA-2C before it could gain altitude. For 15 years the rights to manufacture lay in Eaton’s vault, but (Undaunted) Bud Found did the Phoenix from the ashes thing and the Bush Hawk was born, this time to reappear as the E350 in international skies. Rick is many things: a husband, father, son, nephew, pilot, financial advisor, handyman, gym enthusiast and, now, an author. Rick is bringing the history of his family and their contribution to Canadian aviation to light in his new book Bush Hawk (Undaunted Belief). Explore the author's website to learn more about Rick and his book. Visit the GALLERY to see images from Rick's photo album - including photos of the Bush Hawk and his father and uncles. Visit the CONTACT page on his website to reach out to Rick if you would like to learn more about the book or have a general inquiry. Visit the BOOKS page to order your copy of the book.